For my first book launch five years ago, I had a book tour with about a dozen book signings across the country, as well as countless television appearances, radio interviews, newspaper articles and speaking engagements. But there’s no way I would have had these opportunities if I hadn’t built a solid plan and started my outreach in advance. I started working on my plan nine months before its release to ensure my book was a success. And yet, very few of my entrepreneur friends who write books spend any real amount of time on their marketing plan. Sure, they email their lists and post on social, but they often come to me a month – or even a week! – before their publication date asking how I can help get publicity for the book. And the sad news is…I can’t. Not with that little time. You see, it’s FAR easier to get publicity for a book before its release than after, which is why it’s absolutely critical to start building your plan 6-9 months out, 3 months at a BARE MINIMUM. Done correctly, your book can pay dividends for YEARS – maybe even the rest of your career. I still make 10s of thousands of dollars every year from paid speaking gigs that come from my book…and it’s been out FIVE years!! If you have a book coming out in 2019, join us for this retreat to build out a *complete* book marketing plan. You’ll leave with an individualized plan for your book, including a timeline leading up to your launch. You’ll also receive instruction on how to find free publicity opportunities for your book and templates and swipe copy for your pitches. If you plan to have affiliates or ambassadors, we also have plans and swipe copy for that to share! This retreat will be located in beautiful Savannah, Georgia. One of the most beautiful and historic cities in the South, Savannah has it all — history, architecture, amazing food and a gentle ambiance that will give us the perfect setting for a retreat that’s equal parts inspiring and relaxing! We are excited to be staying in the “Wedding Cake Mansion,” on Monterey Square in Savannah. 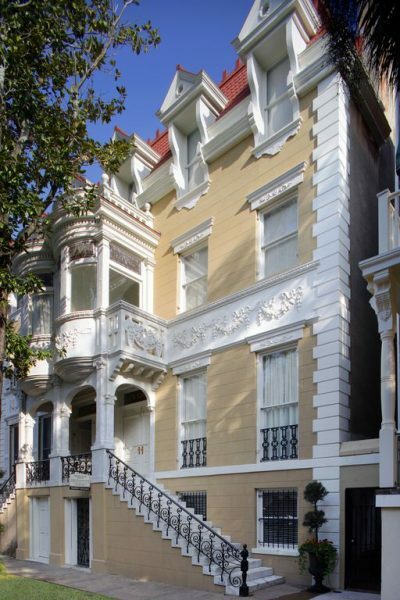 Featured in the movie Midnight in the Garden of Good and Evil, it’s one of the most beautiful homes in the city. If you want the true Savannah experience, you have to stay in a house like this! You will have your own bedroom and bathroom, allowing you time to relax and unwind while you soak in all the new knowledge we’ll be providing. Our favorite part about staying in historic downtown Savannah is that everything is walking distance. We’ll stroll through some of the 22 squares that make up downtown, enjoying the shade of the oak trees dripping with Spanish moss. Some of the fun activities we have planned are a ghost tour (don’t worry, it’s more history than ghost stories) and time to shop on historic River Street. All you have to do is show up with your laptop and your book idea, and we’ll make sure you leave with everything you need to make your book a success!